I was quite surprised there was no poll about the Fellowship, so I made one! If you want, explain your favourite member in the comments. My favourite is Gimli. Why? He's a frickin dwarf, that's enough! My favourite Character always was Boromir (though here I had to vote for Bill the Pony ^^). The strong son of lesser men, that only wanted to save his people from destruction. He falls for the feigned promises of power from the One Ring, yet redeems himself by giving his life away to protect two little Halflings. 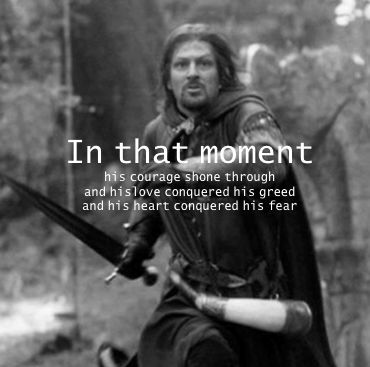 'Relatable' is a good word to describe Boromir, for he, similarly as the most of average nova-days people continuously resists much greater forces throughout the story. Form my point of view Adamin is right about his selection and explanation. Boromir is my favourite member of the Fellowship as well. But I had to select Bill the Pony in the first place regardless. I really don't know why, but Frodo is my favourite member of the Fellowship. idk, Leviathan, if it were between him or Pippin, i'd choose Merry. Of course it's Bill the pony! And second one? Meriadoc, wisest hobbit in fellowship. I've always been fascinated by the fact that his pivotal and fundamental presence deeply (and naturally) influences the Fellowship being him physically present among its Members or not. I'm for Sam! His goodness and optimism are just so amazing. Even in the middle of mordor where hope seemed to be a distant thought! My favourite Character always was Boromir. I always thought and felt same.